I've got that Girl Scout song in my head about one being Silver and the other Gold but it's actually the theme for Monday and Tuesday's Product Class. We are going to be using the Metallic Enamel Shapes for Class and of course, one sheet is silver and the other is gold. Go Figure…. I had a little time this week to create a few cards for upcoming events and I had a couple of left over packets from the Religious Christmas Card class so I needed to clean up the baskets. It's sacrilegious to put the cut cardstock BACK into the scrapbins once it's designated for a card, don't you know? So I whipped up this variation of the card I shared here. Completely different card, using the very same layout. 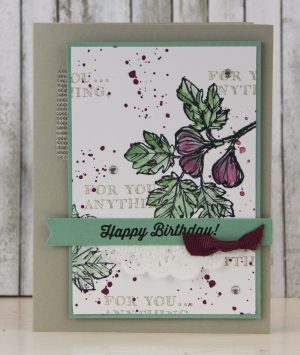 This is the Hostess Set Fabulous Flora…bet you didn't even see it in the catalog, did you! ?